The Republic of Singapore Air Force (RSAF) opened a new pilot training facilities with new 150 Squadron building and aircraft maintenance hangar in Cazaux (France). 49 fighter pilots have already honed their skills since 1998. 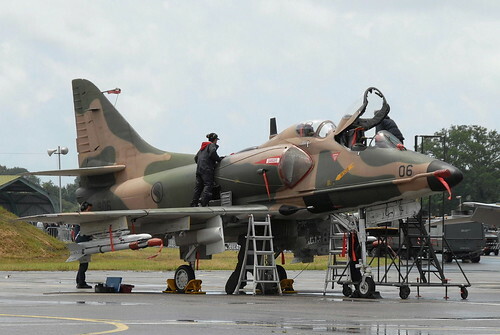 RSAF training group setup a temporary training detachment comprising 100 personnel and 10 A-4SU Super Skyhawk aircraft. According to the Ministry of Defence, this is the first oversea Advanced Jet Training detachment. RSAF Fighter Wing Course (FWC) at 150 Squadron in Cazaux (France). Nicely this is very great article and even usefull to every person. I do believe everyone ought to read this post while keeping discussing it. Many thanks and continue to keep blogging. Excellent way of telling, and fastidious article to get data on the topic of my presentation subject, which i am going to present in school.